Arachidonic acid is the precursor of a broad spectrum of bioactive lipids, collectively denoted eicosanoids. In mammals, the most well known classes of eicosanoids are the prostaglandins, thromboxanes, and leukotrienes, which all have powerful and diverse biological activities related to physiological as well as pathological conditions. 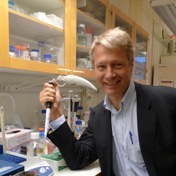 Jesper Z Haeggström’s research is focused on eicosanoids, particularly the leukotrienes (LT) that are involved in a number of inflammatory and allergic diseases, in particular asthma, rheumatoid arthritis, and arteriosclerosis. He and his group investigate the biosynthetic and regulatory mechanisms involved in leukotriene formation at a cellular, enzyme, and genetic level with particular emphasis on 5-lipoxygenase (5-LO), LTA4 hydrolase (LTA4H) and LTC4 synthase (LTC4S). These three enzymes catalyze the key steps in the biosynthesis of the proinflammatory compounds LTB4 and LTC4. Based on research on metabolites and proteins in the arachidonic cascade, a number of new drugs against pain, fever, inflammation, allergy, asthma and glaucoma have been developed and new pharmacological principles continuously evolve from this research area.